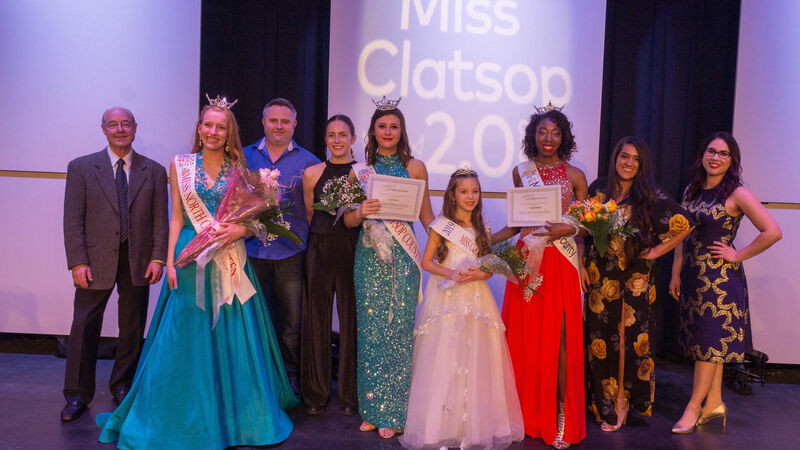 About 550 people watched as 3 young women were crowned Miss Clatsop County 2019, Miss Clatsop County’s Outstanding Teen 2019, and Miss North Coast’s Outstanding Teen 2019 Saturday night at the Seaside Convention Center where $5850 in scholarships was awarded. 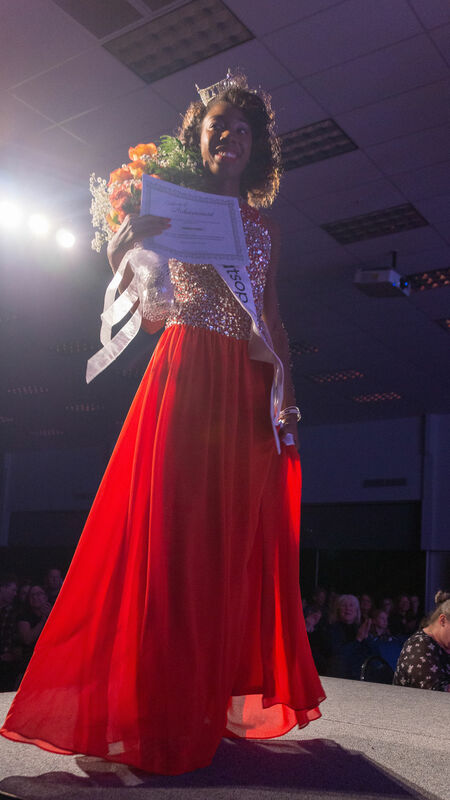 24-year-old Ranisha Speed of Tillamook walked away with $1925 in scholarships being named Miss Clatsop County 2019 as well as being named the Overall Miss Interview winner, recipient of the Miss Oregon Alexis Mather Service Above Self Award for the Miss Division, and the Miss Overall Talent and Red Carpet/Social Impact Statement winner. She also received the Platform presentation award and the Marketing Award. Ranisha lives in Tillamook while attending University of St. Mary getting her Master’s in Business Administration in HR Management. Her platform is “The Better Me” movement. She performed a self-written spoken word about gender pay equity in America. The Service Above Self Scholarship was decided by an essay written by the contestants about what “service” means to them. Named Runner-Up in the Miss division was 18-year-old Viola Soprano, a Seaside High School graduate and current student at the University of Oregon. Viola netted $525 for her efforts this weekend. Also on stage in the Miss Division was 18-year-old Seaside High School Senior Katie Zagata who received the Miss Congeniality Award which added $75 to her non-finalist award of $125; Also 19 year old Samantha Wozniak attending Portland Community College receive the Kindness Award, $100 scholarship will be added to her $125 non-finalist award. 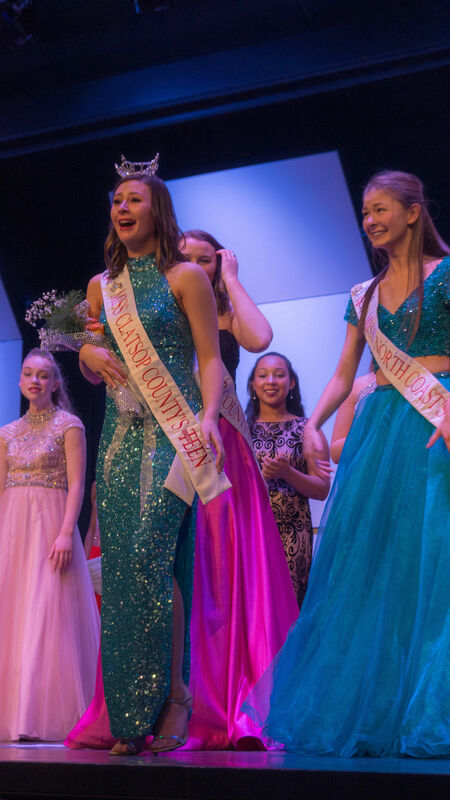 Winning the Miss Clatsop County’s Outstanding Teen 2019 title was 15-year-old Lilly Boothe of Clatskanie. Lilly will receive a total of $525. Lilly performed a musical theatre to “I Love Play Rehersal” from the play Be More Chill. Her platform is “Recognizing Teen Depression”. 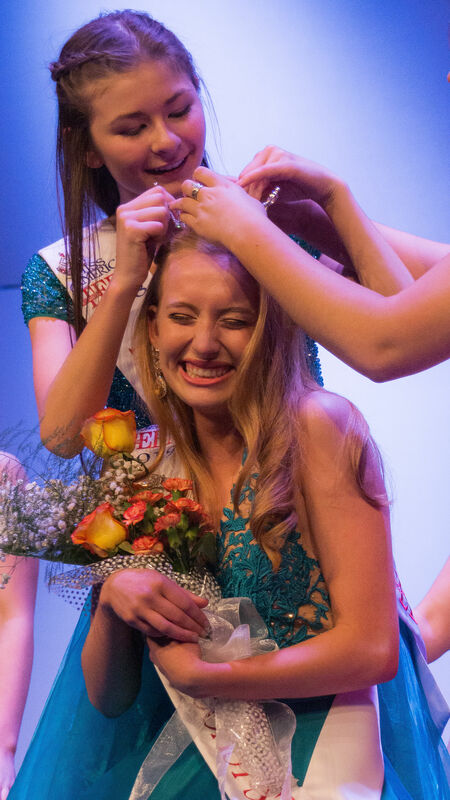 The Miss North Coast’s Outstanding Teen title went to 16-year-old Sydney Rapp of Seaside. She did a tumbling/dance Routine to “Can’t Stop the Feeling” by Justin Timberlake and her platform is “Financial Literacy for kids. Sydney also received the Service Award for $200 and the Style Award for $200. Sydney will receive a $925 in scholarships for her efforts. 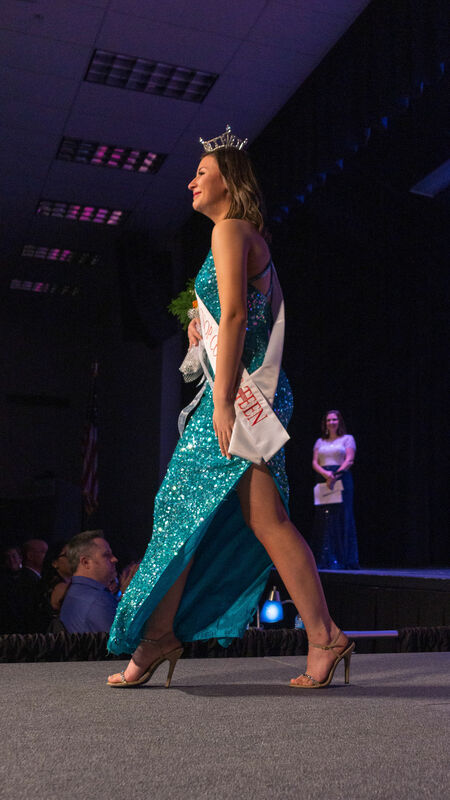 17-year-old Nikkole Sasso of Astoria was named Teen runner-up and Overall Teen Eveningwear Winner and Teen Overall Interview Winner receiving $350 in scholarships. The $25 Overall Teen Fitness award and Overall Teen Talent Award went to 14-year-old Josie Morinville. Josie and all the other teen contestants on stage – Amara Ames, Emmy Huber, and Peyton Sims will each receive $125 for competing. The wins by Ranisha, Lilly and Sydney will move them forward to Miss Oregon and Oregon’s Outstanding Teen competition in late June in Seaside. They will also serve as official ambassadors for our area for the year. 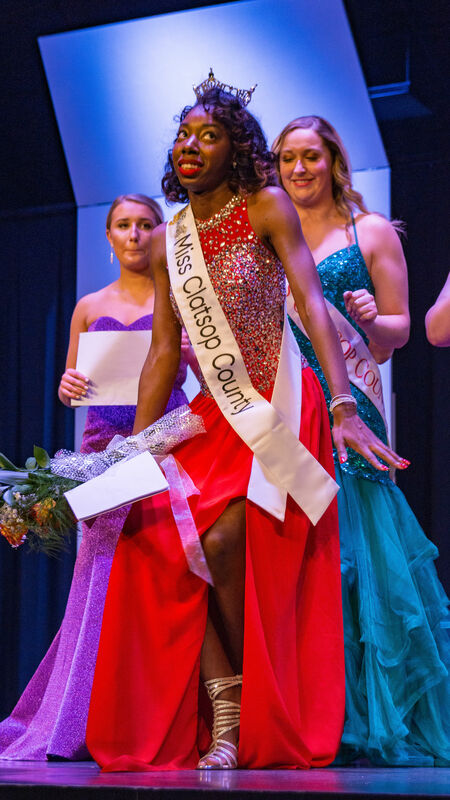 By random draw Shaelyn Bangs was named Miss Clatsop County’s Princess and she will accompany Ranisha respectively on stage at Miss Oregon in June and attend events throughout the county. Also on stage Saturday night were outgoing 2018 titleholders, Haylie Moon, Caitlin Hillman, and Taryn Miller, and Miss Oregon’s Outstanding Teen 2018 Kennedy Hjelte. Miss Oregon 2007 Kari Christensen was the emcee. 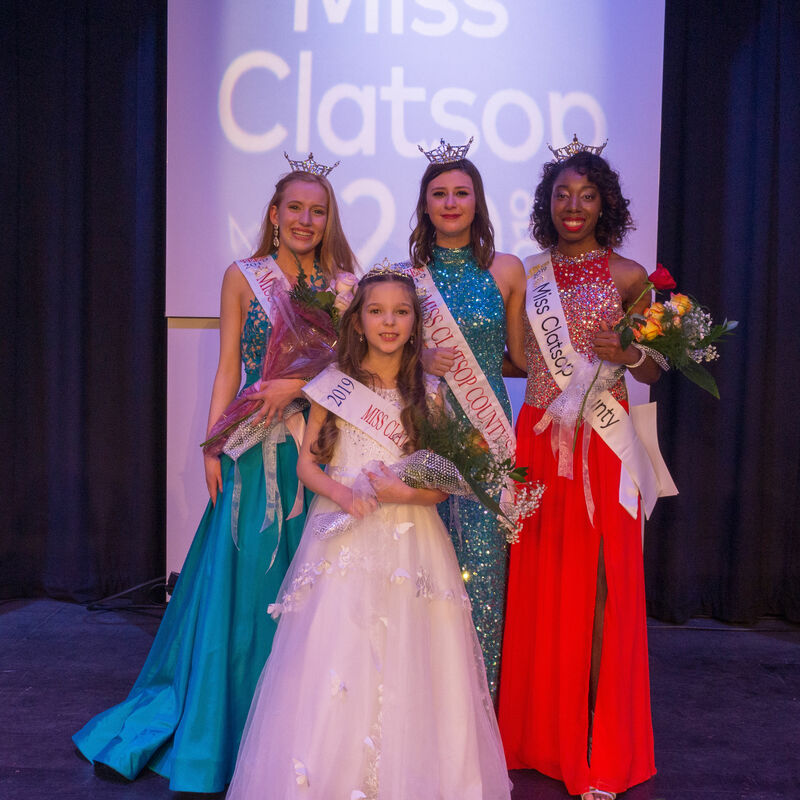 The Miss Clatsop County Scholarship Program is supported in part by corporate sponsors Seaside Kiwanis, Seaside Factory Outlet Mall, Seaside Lazer and Print, Columbia Bank, & Les Schwab Tires. Through the Friday live auction and Saturday’s silent auction an additional $3825.00 was raised for the general scholarship fund. The Miss Clatsop County Scholarship Program is an official preliminary to the Miss Oregon and Miss America Organization, a non-profit corporation established solely to provide contestants with the opportunity to enhance their professional and education goals, and to achieve those pursuits with the assistance of monetary grants and awards. For more information, please contact our Directors, Miss Clatsop County Scholarship Program at www.missclatsopcounty.org. Next article40 Miles of World Class Mountain Bike Trails in the Works!